It will never be known – not even remotely – what the pear pest has cost the State. Revenue, homes, and even lives, of all it has taken its toll. In place of well-kept farms, of prosperous homes, and of contented people, one sees all around the desolating blight of pear. 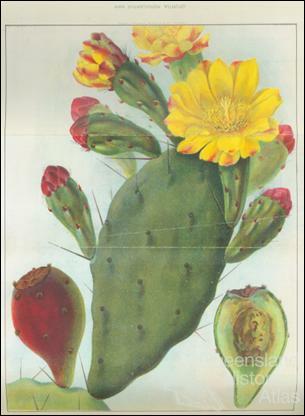 Given the uncontrollable spread of prickly pear, its eradication in less than decade through use of biological controls was spectacularly successful. Prickly pear in Queensland is a generic term for five different Opuntia cacti, which were the main pest species. 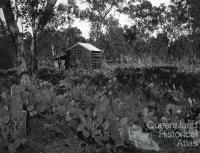 Three were low-growing shrubs up to 1.5 metres high and two were tree pears, growing up to 3 metres. 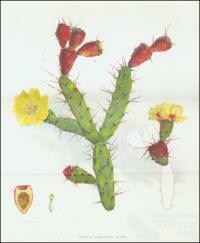 The first species of Opuntia was introduced to establish a cochineal industry. 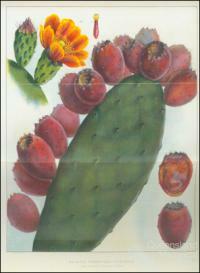 Cochineal is a strong red dye produced by mealy-bugs (Dactylopius species) which feed on Opuntia cacti. The cochineal trade was monopolised by Mexico but the British were keen to establish their own supplies as the dye was essential for the red coats of British soldiers. By the mid-nineteenth century synthetic red dyes replaced cochineal, but prickly pear proved to be a hardy garden plant in rural Queensland, with attractive flowers and tasty fruit high in vitamin C. The pads also made a good supplementary drought fodder for cattle because of their high water content. Why was it a successful invader? 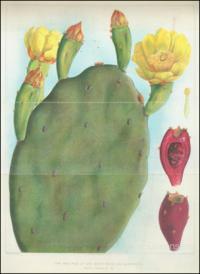 The success of prickly pear stemmed from three main factors. 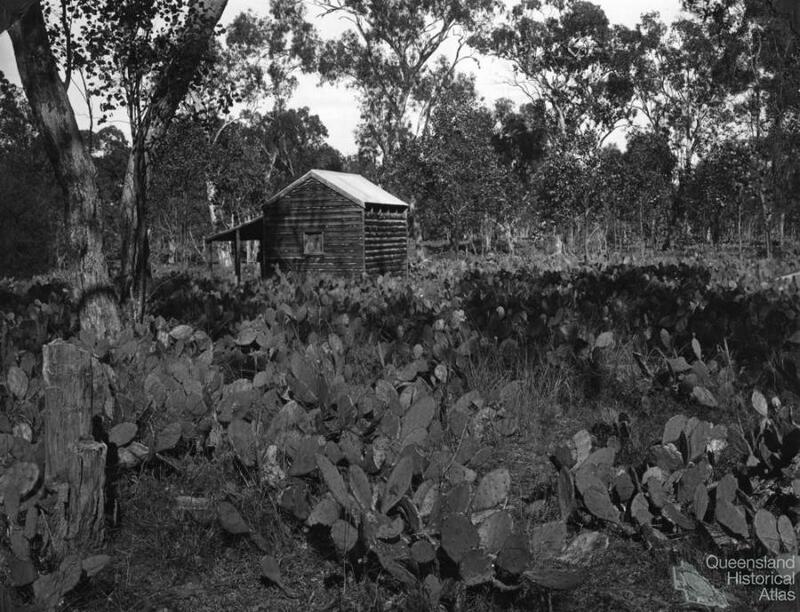 Firstly, the right conditions for plant growth, as bioclimates in parts of Queensland and the source regions of prickly pear species were similar. Secondly, new plants established readily from seeds or pads. 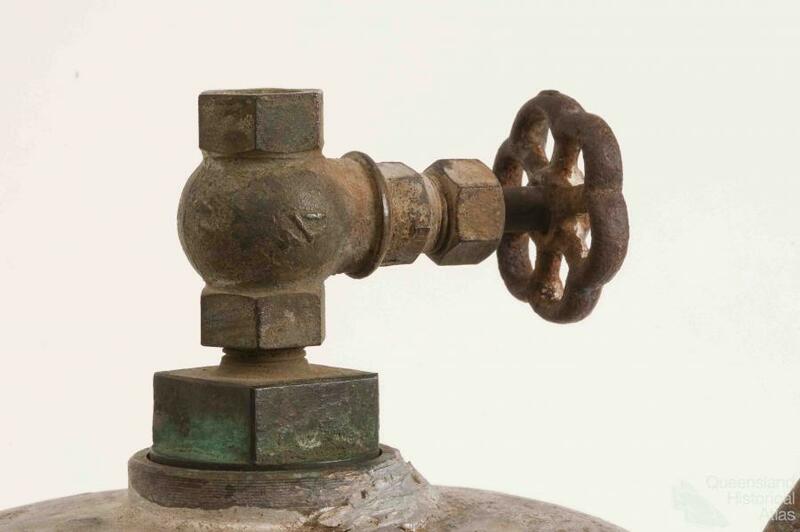 The fruit, which is relished by birds, contains seeds which remain viable for years, and pads broken off the parent plant can survive for months because each contains a store of water and nutrients to provide energy during establishment. 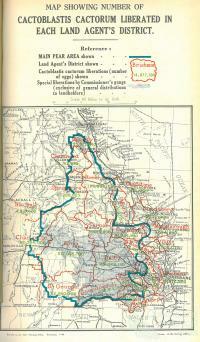 And thirdly, the pads were introduced into pastures for use as drought fodder. Even pads semi-digested by cattle still sprouted. 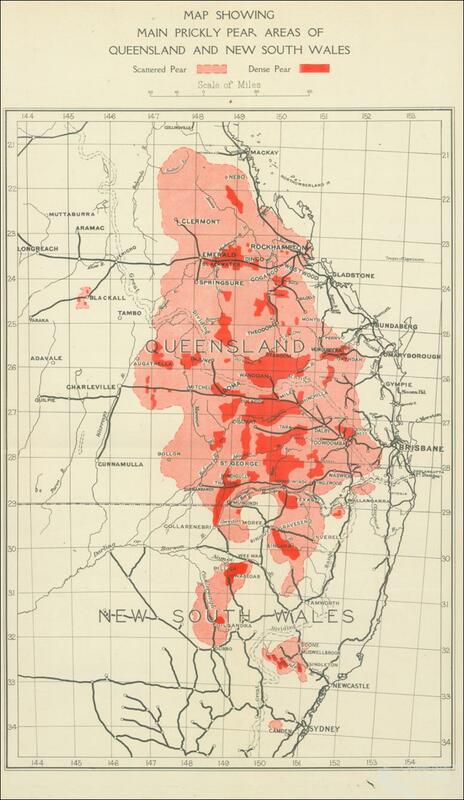 Although concern at the pear invasion had been expressed in the 1880s, its stronghold was in brigalow (Acacia harpophylla) forests of central and southern Queensland where it was not an obvious problem, and by 1900 pear covered 4 million ha. 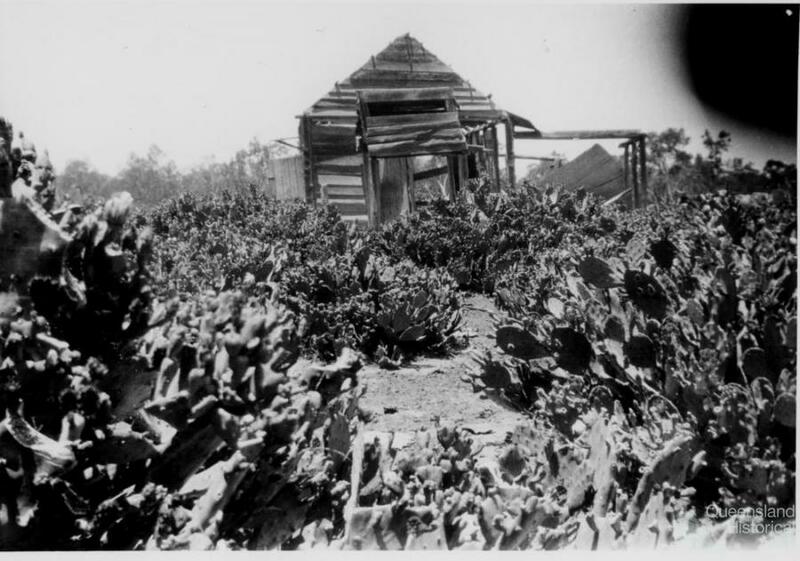 After the 1901-02 droughts, when feeding prickly pear to livestock became widespread, it began to establish in prime grazing land, and by 1920, was estimated to be spreading at a rate of 400,000 ha a year. Considered myself and family trapped on the property - deliberately by the Government as it should have known. The conditions imposed were worse than slavery and impossible to be accomplished, and any smaller area would not have been sufficient to make a living on, according to the market values of commodities … Conditions imposed meant 20,000 tons of prickly pear per annum to clear and keep clean. For those who managed stock on pear infested land, there were additional problems. Horses used for mustering cattle had to have pear thorns pulled out of their legs after each ride or wounds became septic, and sheep shearers wore leather chaps, armlets and gloves to protect themselves against both spines and fine irritant hairs. 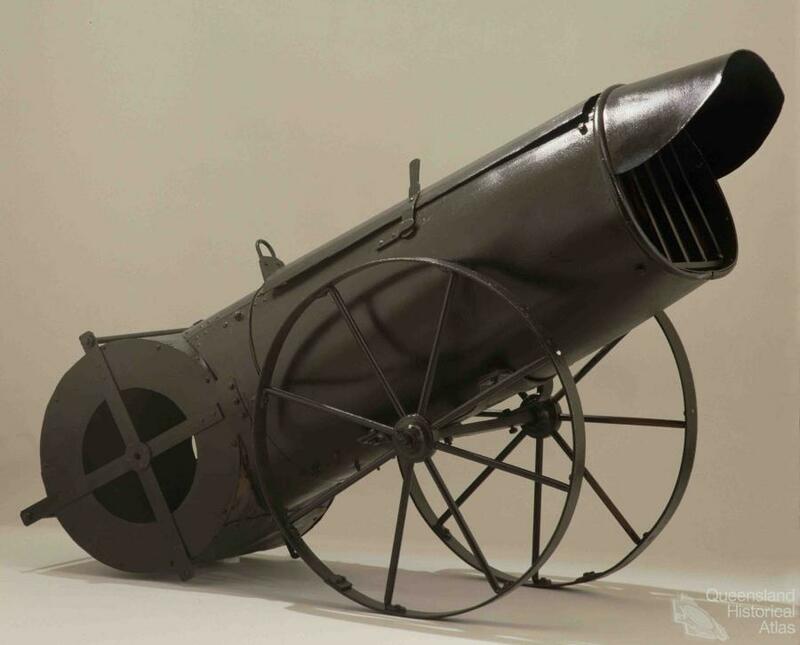 Initially, manual controls were used, by digging up, burning or crushing pear. 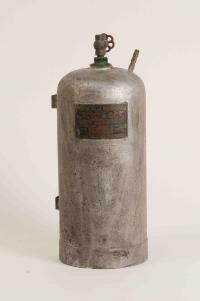 Although research into chemical controls found arsenic pentoxide was effective, it was highly toxic and expensive. A.P. 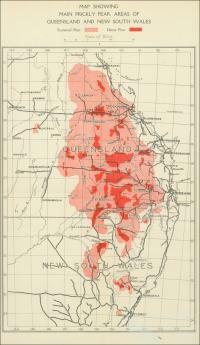 Dodd (1940) estimated in 1940 that control of dense pear by mechanical or chemical means cost about six times the value of the land. 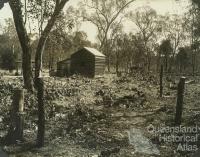 To stop the spread of seeds, Queensland introduced a bounty in 1924 on certain birds, including emus (2s.6d), currawongs (4d) and crows (6d). In 1912 the Prickly Pear Travelling Commission was formed to investigate biological control methods. The Commission visited India, South Africa and the Americas, where prickly pear species had originated or had caused similar invasion problems. 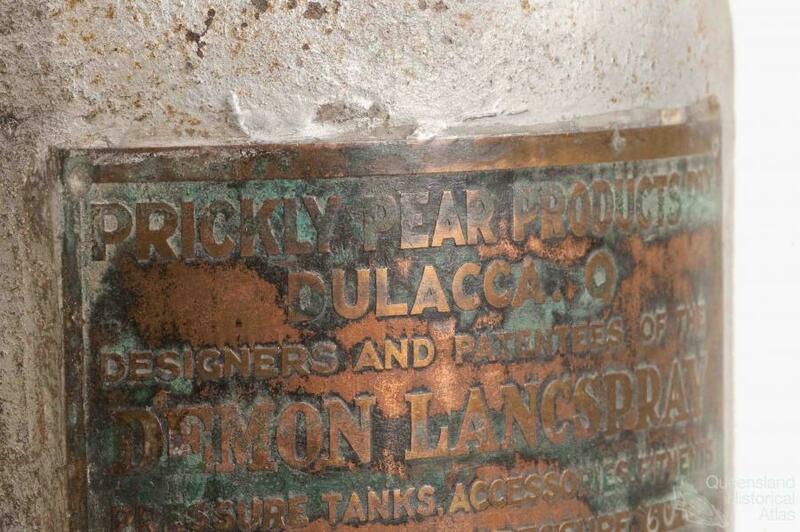 Many insect and fungus species were tried out, and the cochineal mealy-bug, D. ceylonicus, proved effective against drooping tree pear, virtually destroying infestations within three years of release of the bugs. Research was interrupted by World War I, but in 1925, eggs of the Cactoblastis cactorum moth were imported from Argentina. The cactoblastis moth is native to South America, where the larvae feed on a variety of prickly pears. 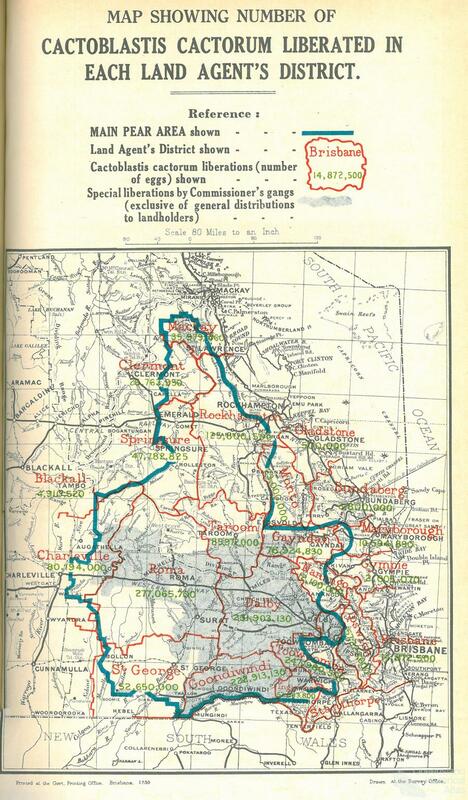 From 2750 imported eggs, over 3,000,000,000 eggs were bred and distributed in the infested areas. 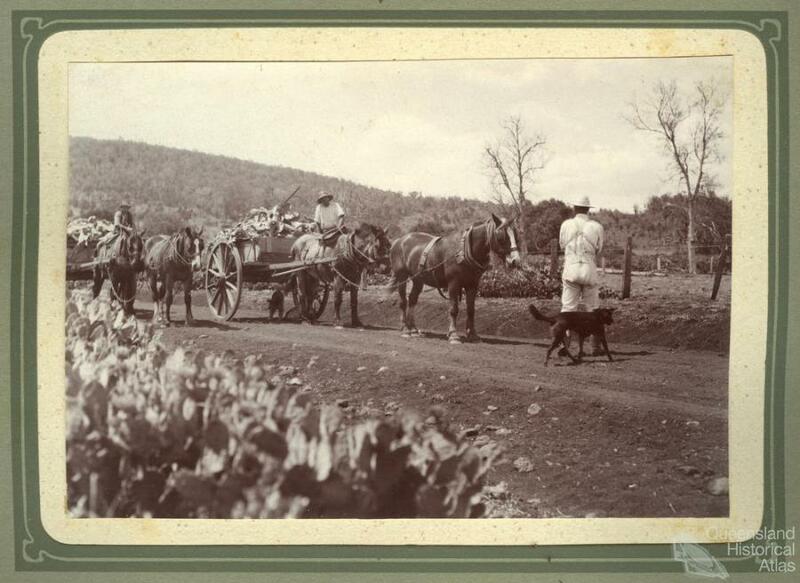 Eggs were placed in paper quills or stuck onto paper squares and these were pinned to the cactus pads by landholders and government employees. The larvae tunnelled into the pads when they hatched, and ate voraciously, killing the pad. 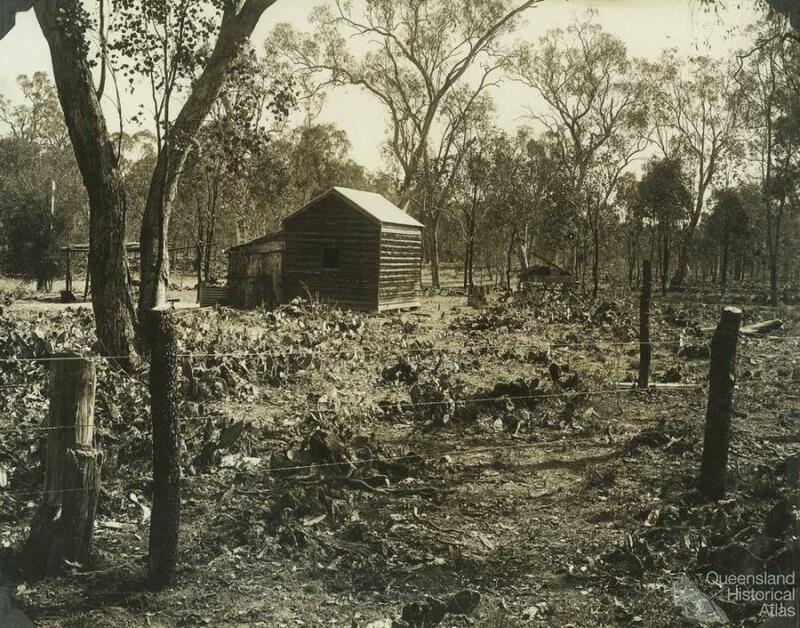 Within seven years of the first release, the last original pear areas in Queensland were destroyed, and the way was open for closer settlement and agricultural development in some of Queensland’s most fertile lands. 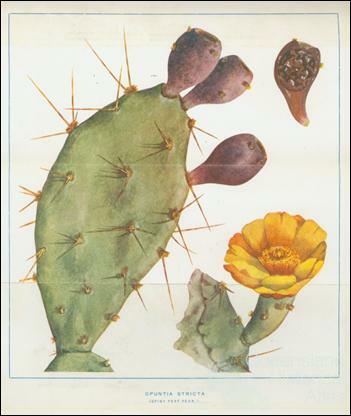 In economic terms, the work of the Prickly Pear Board over 19 years in researching, breeding and releasing cactoblastis eggs was carried out at a total cost of £168,600. 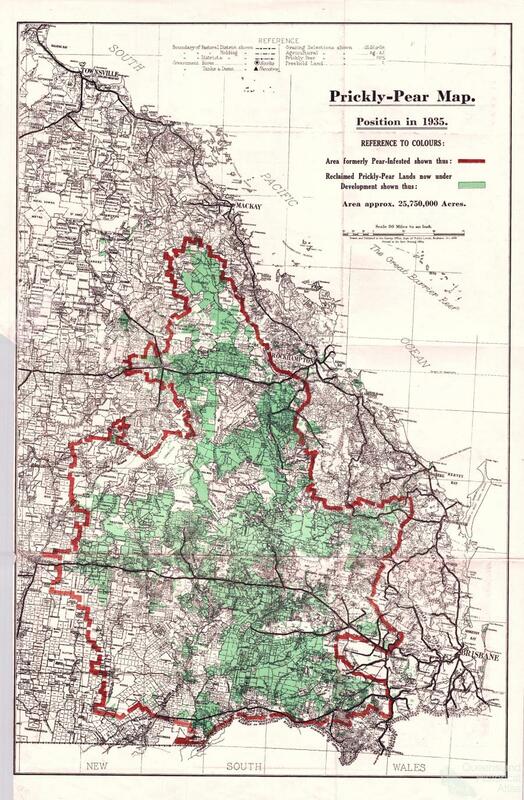 At an average cost of £10 an acre over the densely infected land (30,000,000 acres), chemical and mechanical clearing would have cost £300,000,000. However, the most outstanding feature of biological control for prickly pear was that the control insects fed only on the targeted pest species, thus avoiding problems such as those with the cane toad (introduced as a biological control for sugar cane pests in 1935). Prickly pear is still found in Queensland and it is a declared weed, but in most cases the cactoblastis moth continues to control this invasive plant. Bring to a boil - add 4 ½ cups of sugar - bring to a boil again and boil for 1 minute, stirring constantly. Remove from heat and skim the froth off for nice clear jelly. Pour into jars and seal with melted paraffin.